Over the years we’ve received requests for bright orange hunting garments to increase visibility during hunting season. In response we’ve created a line of dog hunting gear designed to keep your dog safe because it’s easy to see. The prolonged hunting season creates the need for high visibility over several months and different seasons. 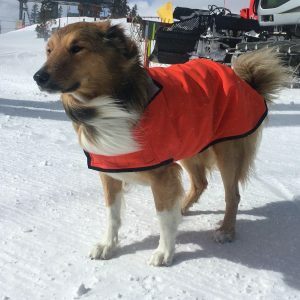 Free roaming dogs in the mountain towns are often at risk – and it’ll be easier for you to spot your dog too when it’s just the two of you out for a walk. You can choose the hunting dog coat, sweater or accessory for each season. For warmer weather there are bright-orange collar tubes and bright orange bandanas. For colder weather we’ve added a bright-orange Power Shield high-loft for your hunting dog’s coat. Power Shield is our top-of-the-line softshell. It’s an amazing fabric, engineered to be highly water and wind resistant. It’s exterior is abrasion resistant and won’t snag or pull. The high-loft interior helps regulate your dog’s core temperature through a membrane which releases unwanted heat during periods of high activity. When activity lessens the cells contract to retain warmth. This is a bold, bright, orange coat which will be easy to spot in most outdoor situations. 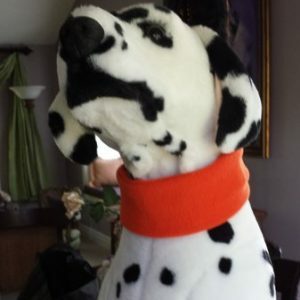 We’ll be adding sweater-weight orange fleece dog sweaters as we locate ones we feel are appropriate. Lighter garments can be worn in spring or fall. 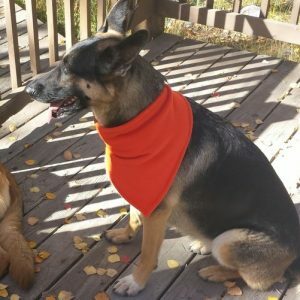 MountainMuttDogCoats Boulder was created in 2011 to meet the needs of our canine family members living in the Rocky Mountains. Our goal is to create warm, properly-fitting winter coats that offer protection from long, harsh winters. We use lightweight technical fabrics engineered specifically to protect against wind, cold, water and allow for varying levels of activity. These coats have been successful and are worn by dogs in 17 states from Alaska to New Hampshire.